I know there is a different between rough coated and smooth coated chows (I have a smoothie ) but I have been noticing that there seems to be a difference in chow faces (most noticable on roughs). Some chows have wrinkly, flatter faces, where as others have smoother faces with longer snouts. Same with the manes... some seem to be set back farther on the chows then others. 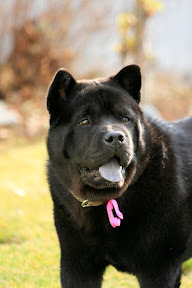 There are quite a few entries on the site about the difference in the faces, and body types of chows. The longer muzzled, more open faced type seems to be more like the original type of chow, (there are pictures of the early chow on the site too) They tend to have leaner bodies, longer legs and are a lot more athletic, I think Melanie's Khana is one of the best examples of this type. The more squishy faced ones, seem to be a newer type, their bodies have more bone and they are a bit heavier. All the chows though can have problems with hips, elbows and knees so it's really more about the testing done of the parents of the puppie and the grandparents and the great grandparents. After that it is about personal perference. I myself prefer the longer muzzled, leaner type, most of my chows have been this type. They do better I think walking with me on nice long walks. They also seem to tolerate the heat and humidity of a Minnesota summer better. Yes,Victory explained it perfectly! The open faced Chow has the longer nose and leaner body with longer legs. 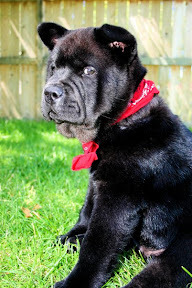 The closed face Chow has the short muzzle and stocky body. I have one of each and have had 2 opened faced boys and one was from a BYB and my present boy Kai is from a shelter. The closed face Chows I've had were all from "show breeders'. May I add that didn't make them any better or any healthier. Most of the UK chows fall somewhere between. Our chows dont have as long legs as the US open faced ones but they have mostly open faces. There are different rough coats too. There is the long rough coat which requires a lot of brushing and care and then there is a shorter rough coat like Bramble that I can get away with hardly brushing at all. It seems there is a huge variation in styles of chows and like others have said it is just a matter of preference. Mine has the shorter hair and long face. I wanted the longer face chow thats why we went with him. And Yumi well she heavy boned in comparison squarer in body shorter in the leg and nose, and trips over her huge bear paws which just makes me adore her more lol We do have to monitor her feet as they can scuff to the point her nails get worn down on top rather than the tip and she has to be booted. can any of you tell me what hannah is? a rough coat or a smooth coat? I always thought the rough coats were very very fluffy but I've seen so many variations of coats I'm not sure what hannah is classified. Hannah looks like a rough to me with a shortish mane. This may grow longer as she is only young. She looks like her coat could end up very similar to Brambles. Wow Yumis face has really filled out. I hadn't really noticed there was such a big difference between her and Taishi before. They are all looking great. Hannah is a rough coated Chow. I have a smooth girl Chyna that has a fluffy smooth coat but I've had 2 other smooths that didn't have as much under coat as Chyna. They are so many different variations in both rough & smooth coats. 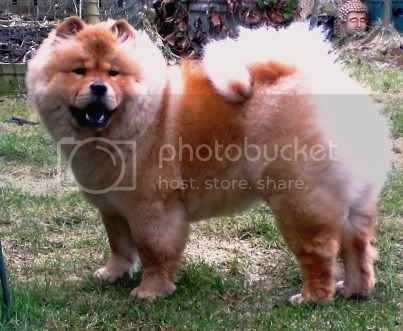 If you google english coat chows there is a difference in length of a rough coat and smooth coat .. I never knew this before but a breeder told me this. English usually have 1-2 inch coates with a mane still , according to the person I talked to. Its very interesting all the different colors and coats.. Here are 2 pics of Little Bear, she is pure smooth and she has no mane at all!! Just in my opinion Hannah looks like she might fall somewhere in the english coat mixture. There are a few pictures of the english coat chows on websites but its hard to tell until the adult coat is fully in. And the picture is hard to see the back too.. Good luck on this.. there are just so many different looks . Winston is a purebread Smoothie as well. You pup looks Rough Coat. 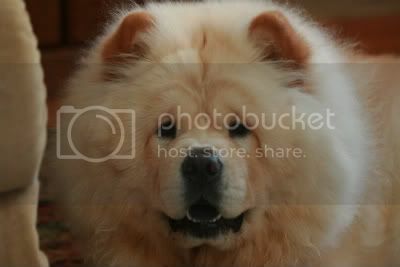 As far as I know, the open-faced ones with longer muzzle are more like Chinese domestic chows. 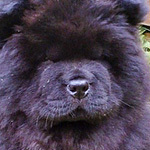 Those chows with shorter muzzle and squishy (or push-in) face have Russian or American origins. They are all beautiful and cute You can choose the type that you like the most. 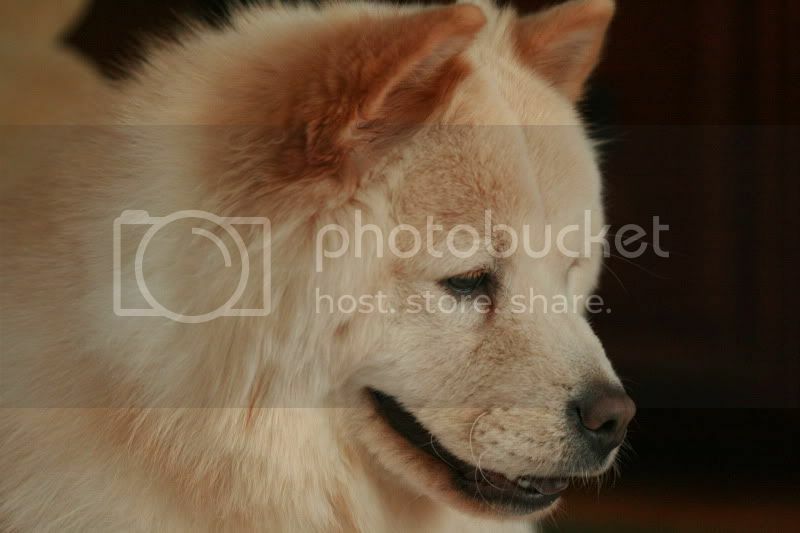 Hello i have a chow chow and i kind of need guidance on if she is purebred or not and if so what kind of chow she might be, though i now she is rough coated but im not sure about her face. when i search open face chow or closed face chow on google i just get a whole bunch of food images... so here is an image of my little girl. ~ oh and when you might consider if she is pure bred or not put into consideration that she is only 27 lbs. and full grown i think at a year born in may. Well, she does have a very long slendr muzzsle, a nice ruff, but not the "mane" most chows have. She appears to be very slender which is okay. But at only 27lbs if she's pure chow she's very very small and not anywhere near breed standard. What color is her tongue and what about the shape of her feet, tail and tail posistion. Even small pure breed chows have "cobby" bodies, (very square) even the longer legged ones like mine. I don't think your girl is pure chow, but I'd need more pictures to know for sure. And it doesn't really matter though unless you were going to show or breed her. You can tell from your dog's tongue. A purebred Chowchow should have a blue/black/purple tongue. If there are pink spots, he/she should be a chow mix. she has a blue purplish black tongue with no pink spots. her body is square, her but kinda waddles when she walks and i think thats because her hips are at the same height as her shoulders. her tail is up on her back and she has big paws which at first made me think that she was still growing. Better pictures tell the story. She's a chow. That waddling stitled(sp?) gait is because her back legs are straight, (another trait of chows) it causes a very distinctive gait. She looks like one of the chows I call "the old type" If you do a search on the site for pictures of old time chows, you'll see she looks very like them. She even has the bi-coloring of them, like my Dreamdancer does. (Picture of him in my signiature, he's the cinnamon and cream one with the dirty look) Many of them don't have the huge manes of the other types of chows, (they are easier to groom because of it) I've found, (Dreamdancer is my second one) that their fur tends to be short, (2-2.5 inches over the body, 3-4 in the mane and tail, and feathers on the back legs) but very, very plush, like really good velvet. 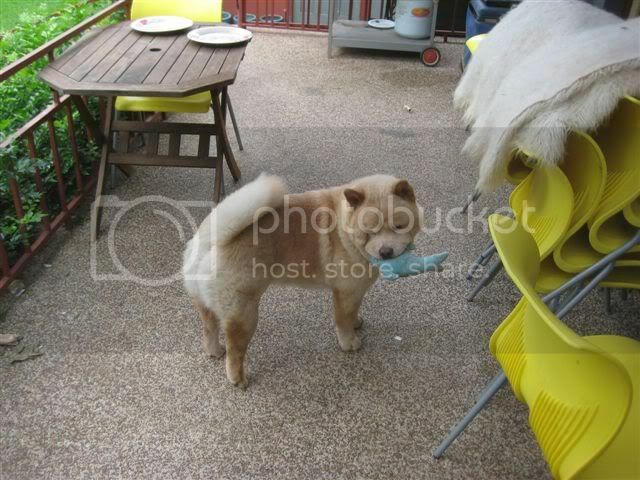 what are the chances that i can purposely find another "old time" chowchow because im considering getting another one for her to play with when i move out of my parents house and i dont find the other kind as attractive. also is it a rumor or is it actually true that the more original looking chows have a better disposition? No one could give me an answer why American Chow Chows look so much different than European Chow Chows. I am bit puzzled why there is differences in how both of my Chow Chows look. I know there is rough coat and smooth coat Chow Chows. But between my two dogs I am not so sure that Teddy my female is really a pure Chow Chow she looks more like a wolf dog to me. Lobis Cunami on the other hand ( my baby in my siggy ) he is all Chow Chow and looks like a Bear and that is how they are shown at shows and appear in books. So why the same title named Chow Chow, when there is obviously a major breed difference that can be seen between my American Chow Chow Teddy and my European Chow Chow Lobis Cunami ? I really would love to find out more about this and where was the breed mixed in the end ? 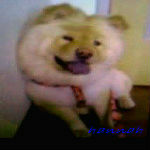 Here is a picture of Teddy our female Chow...compared to Lobis Cunami in my siggy she looks totally different. 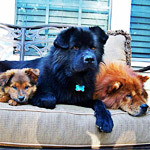 Lobis Cunami wrote: No one could give me an answer why American Chow Chows look so much different than European Chow Chows. I am bit puzzled why there is differences in how both of my Chow Chows look. I know there is rough coat and smooth coat Chow Chows. But between my two dogs I am not so sure that Teddy my female is really a pure Chow Chow she looks more like a wolf dog to me. Lobis Cunami on the other hand ( my baby in my siggy ) he is all Chow Chow and looks like a Bear and that is how they are shown at shows and appear in books. Your girl Teddy is the "classic" chow chow. She's how they originally looks way back when. But they've been bred to look like your boy Lobis Cunami for a long time now, it's more a matter of what lines they come from is my understanding. But they're all chows at heart.